Liam fell asleep about 6 hours ago and so I figure I better throw something up here quickly before he wants to get up at about 2am and play for the rest of the night. I had a great first day of my vacation. The Wife and I took turns helping my parents get some things done without a car while theirs was in the shop, which gave each of us an opportunity to wake up playing with Liam. There’s no better way to start the day than by playing with this wonderful son of mine. He’s just about over the cold I gave him last week and so suctioning and ventilator maintenance has gotten a bit easier yesterday and today. He’s also finally back to his playful self and spent most of the day wanting to play which is fantastic. The afternoon was spent reading to Liam aside from the short while that I made it out to the gym. I haven’t been since I got sick last week and so it was very important to me to get there today. More important though was the time spent in the living room reading and playing with the boy which is how I spent the majority of my day. If he’s awake and engaged in what daddy’s talking about we read his books. Mo Willems, Chris Van Allsburg, Grover. But when it’s time to calm Liam down or to help him sleep with the soothing melodious voice of his father I usually just read whatever I’m reading. I didn’t want to read him Maus by Art Speigelman. We’ll save the holocaust for a couple years at least and so I picked up the copy of Neil Gaiman’s Stardust that I had on the kitchen table. It was prominently displayed by the check-out counter on a shelf marked Librarian’s Picks on my last visit to the library. Liam likes Neil Gaiman. He’s heard Coraline, The Graveyard Book and selected chapters from American Gods. Stardust reads like a fairy tale anyway, and though Karin took issue with me reading about a witch gruesomely field dressing a unicorn, the book wasn’t all that inappropriate. A boy on a quest for a fallen star to bring back to his true love. How bad for him could that be? Reading aloud has changed the way I read. It is a different type of reading and one that I feel I am getting very good at. Scanning ahead to the end of the sentence to ensure proper inflection and tone. It helps my comprehension, recall and understanding of how sentences are constructed and flow. I find myself lately reading aloud even when alone. You should try it. A few night’s ago I noticed that our overnight nurse carried in a copy of Huckleberry Finn. “Are you reading Huck Finn to Liam?” I asked with great excitement. “umm well, … I’m reading it, but…sometimes if he’s almost asleep I’ll , umm quietly…” It seemed to me that maybe she thought I didn’t approve. That maybe she thought my excitement was because I was upset. “Please do! I would love it if you read him that!” As one of my favorites I was a bit jealous that I hadn’t yet thought of reading it to him. I may need to get out my tattered, worn copy of The Grapes of Wrath and make sure that Liam hears his Daddy’s favorite American novel. The syndrome that Liam has been diagnosed with greatly effects his brain. Because of this, we are unsure of how much verbal communication Liam will ever understand. The excitement that Karin and I bring to a story that we love reading to him means so much more than what words we are reading. I love reading fantastic stories to Liam like Stardust and The Hobbit because I get to make up fun voices for characters like dwarves and witches and put on a little show. Reading The Grapes of Wrath with him will allow him to hear how much that story means to me. It will also allow me to dig a bit deeper into the writing than I ever have before as I read the book aloud for the first time. Not sure I’ll get through it all though. Damn Steinbeck makes me cry even when I’m reading silently to myself. After a wonderfully relaxing afternoon I dragged the grill out of the garage and cooked burgers in the cold for dinner. After stuffing ourselves Karin and I watched The Night Train win gold in the 4 man bobsled before I set up camp on the couch by Liam’s crib for the night and Karin went up to bed. Not a bad way to start any weekend or vacation if you ask me. They’re starting to pile up again so here’s a bunch of links of the crap i find on the internet. Apparently the state of Utah has gone batshit crazy. 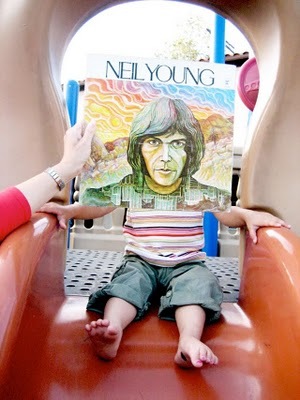 Sleeveface some very cool photos involving album covers. These guys wore over 200 different T-shirts to make this very cool video. Check out the carnage of the T-Shirt War. Speaking of celebrity websites and blogs; if you are not reading Roger Ebert’s Journal you’re doing it wrong. It’s not just about movies. ← Don’t bother me I’m on Vacation. A vacation from my problems.